For years weather forecasts and nautical warnings have been transmitted throughout the world on short-wave radio to enable ships to receive the information. 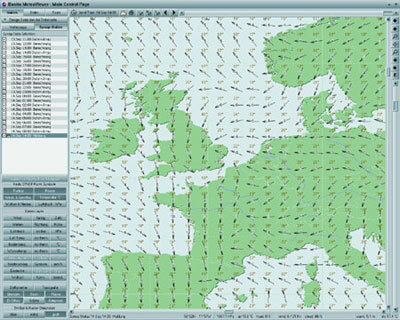 Now, using MeteoCom 6 software, a computer can display all the details. Bonito’s software makes it possible for even the layman to analyse complex meteorological data. You don’t need to have studied meteorology to be able to understand the general weather situation. 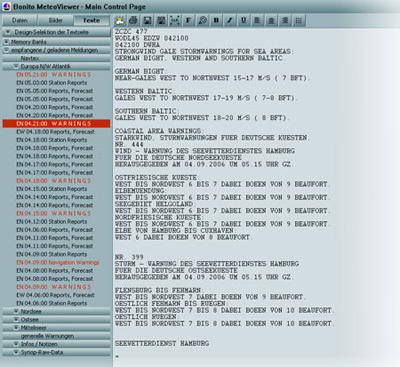 With a computer, a SSB radio (world receiver) and the MeteoCom 6 software you can receive and display weather fax images, forecast, Navtex, CW, Synopsis data and even spoken messages on your computer, with highest quality, worldwide. The soft-ware automatically controls the frequency tuning of the SSB radio (if controllable) using the NautiCom switchbox which is supplied as part of the package. This enables fully automatic timer operation which also makes it possible to switch off your computer at a set time. The integrated frequency list gives you access to all broadcast stations and frequencies worldwide. This way you can easily create your own timer list. The software runs through the timer list and you can concentrate on other things like…sailing. Even radios that are not controllable can be used thanks to simple tuning displays. 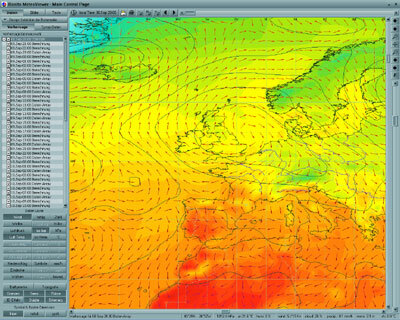 All received data are separated by MeteoViewer and displayed in a very concise and understandable way. By simply double-clicking on the various images and messages they are made visible and audible. The reception of weather data continues in the background, of course. 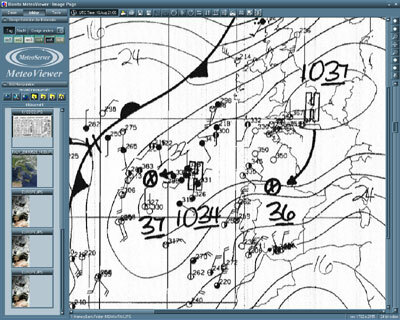 WeatherFax is displayed at the highest resolution, so you can make out and analyze every detail. Navtex, forecasts and warnings are saved fully automatically, pre-sorted by region and displayed by MeteoViewer. will be decoded immediately and entered into the world map as small symbols. By clicking the individual symbols you get a text message for that point. You can also set up schedule grids for wind, barometric pressure and temperature. Impressive animations of this data are displayed fully automatically. You also have optional access to the internet weather data provided by the MeteoServer. This data is available in high resolution and worldwide. In order to keep the data volume as low as possible new technologies are being used which process the data for your PC in an efficient way. You can conveniently download the forecast for the next 7 days in your Marina and receive the actual data via short wave when back on sea. 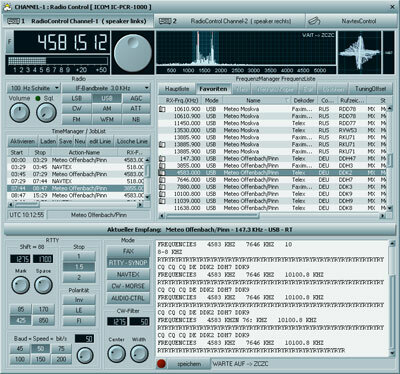 With MeteoCom 6 you can even control 2 radios. As a combination for all offers there is a separate Navtex receiving antenna for permanent Navtex reception. Therefore it becomes unnecessary to interrupt a running reception of for example WeatherFax. The computer must have an Intel Pentium® III processor with at least 450 MHz, 256 MB RAM, a sound card with a Line-In or Microphone port, a spare COM port, and either Windows 2000, XP or Vista installed, as well as a graphic card with 1024x768 resolution. The program CD ; the Bonito switchbox; a user manual and a special audio cable.